Lilies of Pewter Cremation Urn is truly unique. 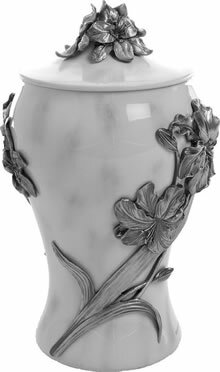 The urn is made of cold cast polystone with a hand-painted marble finish. The hand crafted pewter artisan lilies wrap around the urn and are exquisite in their detail. The urn cavity is easily accessible from the top by a removable lid. This urn is not large enough for an adult but would be perfect if one is sharing cremains, or for a pet, young child, or infant. Measures 10" x 6" x 6" with a volume of approximately 60 cubic inches.